The theatre department facilities are a workshop for actors, costumers, stagehands, and directors. 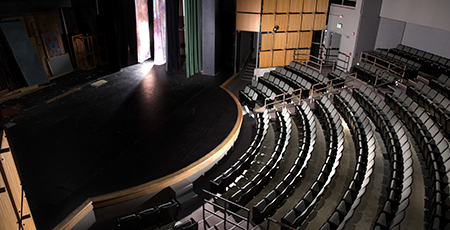 The theatre department facilities are located in the Center for the Arts, which was dedicated in September 1995, and in Kroencke Hall, which served for many years as the only theatre on campus. All theatre spaces have been designed to serve as teaching studios and laboratories. In every case, the interests of students — learning to do and make theatre — were given highest priority. Each environment, including the rehearsal spaces, scene shop, costume shop, control booth, and dressing rooms, serves as a studio for the teaching of theatrical techniques. The theatre department is committed to teaching students using the most advanced methodology and technology. 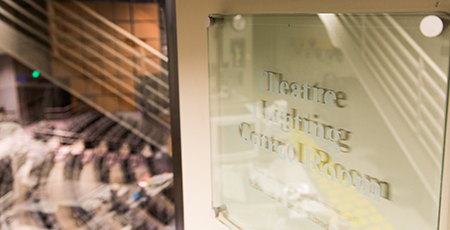 In addition, theatre faculty offices are located near the instructional spaces to support close working relationships between faculty and students. The University Theatre is a 275-seat facility that offers a spacious stage area for performers and designers to exercise their imaginations while maintaining a highly intimate relationship between actor and audience. Under the gently curved stage apron is a 25-seat orchestra pit equipped with a full-trapped mainstage and double-decked side stages for environmental staging. This theatre is supported by two fully equipped control booths and an extensive catwalk lighting system and serves as the venue for most of the theatre department’s major productions. The Studio Theatre is a 40’x 40′ “black box” with its own state-of-the-art lighting and sound systems. A technical operations center opens out into an overhead gallery that may also be used for staging. The space is highly flexible and can accommodate arena, thrust, traverse, endstage, and environmental theatre arrangements for between 80-100 patrons. Each year, this venue holds faculty-directed mainstage productions, student-directed showcases, and experimental projects. Formerly the campus theatre, Kroencke Hall is now the principal laboratory for acting and dance classes. Its transformation was completed with a newly installed sprung dance floor and mirrors along the entire east wall. 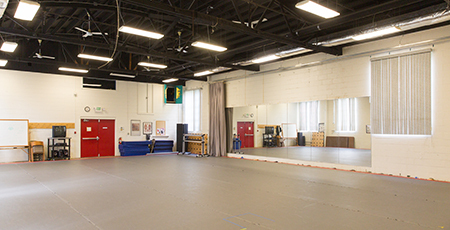 The studio’s footprint is almost exactly the dimensions of the University Theatre and therefore also serves when needed as a rehearsal hall for mainstage productions. 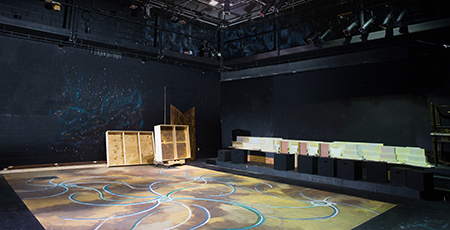 Directly adjacent to the University Theatre stage floor, the scene shop provides facilities for constructing scenery for all departmental productions throughout the year. 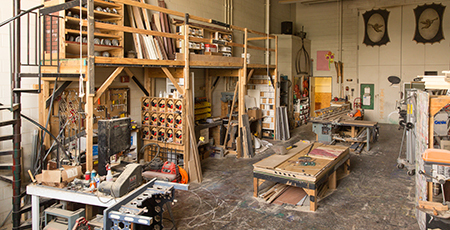 Stagecraft students learn to work with wood, steel, and a variety of imaginative materials to create highly innovative environments representing a wide range of theatrical styles. The scene shop employs up to 10 students per semester. 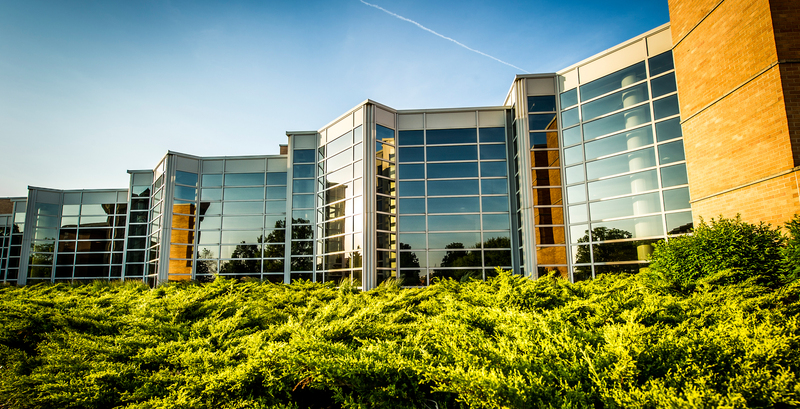 With its great window and wonderful natural lighting, it is a pleasant and efficient place to work. 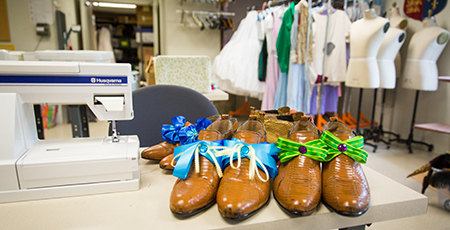 Located in the Center for the Arts, the Costume Shop is where costumes for theatre productions, musicals, operas, and dance are created. Costume assistants work alongside the costume shop supervisor on the construction, alteration, and maintenance of costumes and accessories for the theatre season. Features of the costume shop include: north-facing windows that allow an abundance of natural light into the space, domestic and industrial sewing machines, a dye vat, laundry facilities, and a crafts space. 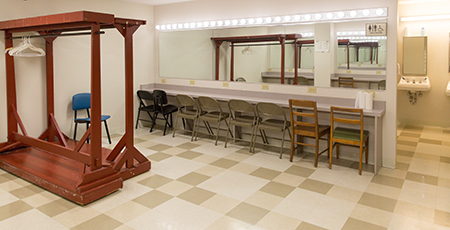 Designed to accommodate as many as 20 performers each, the dressing rooms are fully equipped with shower and restrooms as well. The theatre department’s makeup classes are also taught here, which allows students to learn the craft and later practice it in the same environment. 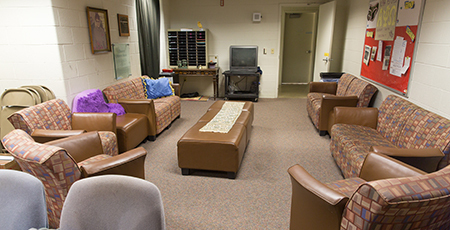 Located next to the dressing/makeup rooms, the spacious lounge, solely dedicated to theatre students, provides a welcoming place for students to study or relax and also serves as the central meeting room for Alpha Psi Omega, the National Theatre Honor Society. It is equipped with comfortable furniture, study space, student lockers and mailboxes, a theatre/script library, a microwave, and a refrigerator. The theatre department is committed to teaching students using the latest technology. The University Theatre is equipped with a large technical gallery for the operation of lighting and soundboards and a stage manager’s booth for calling cues. Likewise, the Studio Theatre is equipped with its own technical gallery, lighting and soundboards, and stage manager’s station. Sound and lighting control in both theatres are fully computerized. Equipment is new and state-of-the-art.